You can see how the man hasn't slept in weeks...or is that the consumption setting in? Poor poor chap. Oh how horrible! I can only say that I am lucky to be a woman; if I grew a mustache, I would be as concerned and sleepless as this poor chap. I do hope that he is able to retain his mustache rather than lose it to a petty thief who does not deserve it. Even worse than the moustache-nap is the moustache that ran away to a better lip. Imagine the rejection. That looks like the rebound tash to me. It's clear to me that his moustache is false and has obviously been harvested from the right-hand side of his fringe. That is the look of guilty deception we see. I am inclined to agree with Mister Anonymous here. Clearly the man is attempting to deceive and is causing his Christian soul much torment in doing so. Just found this fantastic site, as an owner of a reasonable moustache I feel right at home. How sad to be ridiculed by ones own mustache, maybe he should try a (drum roll) mustachio! What a fun site! 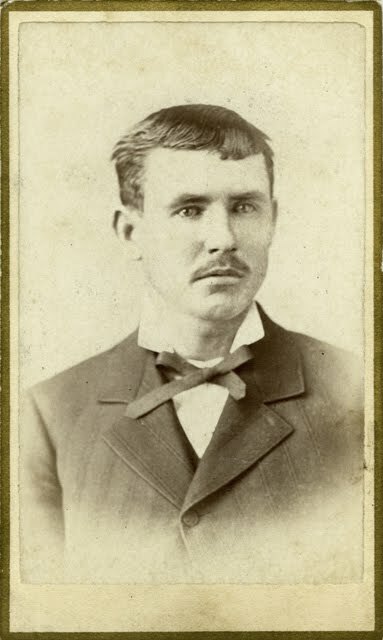 I am researching a desperado called Sam Brown who killed over a dozen men and finally met his end in Nevada Territory on his 30th birthday in 1861. One eye-witness remarked that he wore his long, red whiskers knotted under his chin! Does this mean his mustaches or beard? Do you have a photo of anyone wearing any facial hair like this? The Desperate Mustache looks really very handsome. even others are also very passionate. keep it up. Yes, there's a definite look of fear here, almost as if he senses the mustache-nappers stalking him in the dark of night. Better sleep with one eye open! i just found this site and i <3 it so much!! now i want to blog about my hubby's handlebar! Appearance does count. I agree on the description on the man's mustache. Poor chap. No better mustache our their then the modern day tom sellek. you are right, this man does look quite desperate. great blog! I know, you want to achive your aim of getting better job. Everything you need is try first writing service, which contans a lot of profitable papers.